If you’re anything like me, you bear a little bit of enmity for the winter season, not only because it frosts your windowpanes and chaps your skin, but because it is cloaked in a seemingly grainy, black-and-white-photo kind of quality all season long. The kids seem to find joy in the snow days that free them from the shackles of math class, but even they grow antsy for warmer weather to throw off their shoes and wade in the creeks winding through the backyards of the subdivision. And, landscapers like us become a little morose due to the fact people are usually far too busy with holiday decorating to pay any mind to their backyard spaces. Winter does not have to be the red-headed step-child of the four seasons! 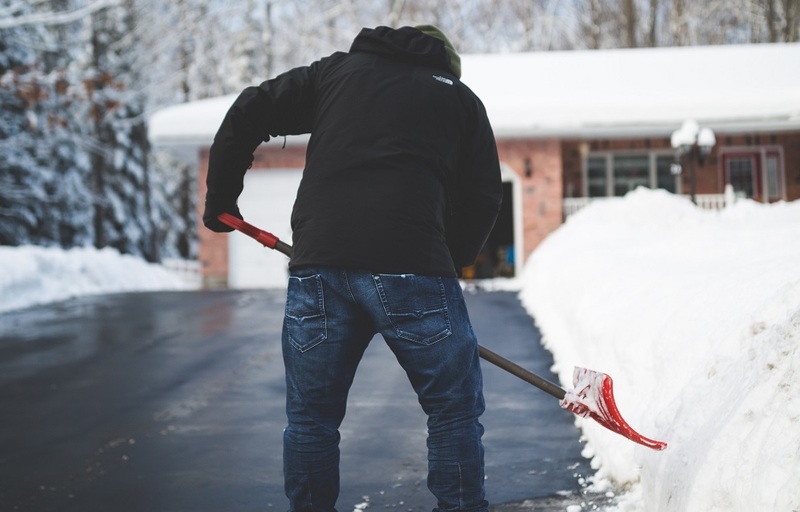 Believe it or not, we can perform many landscaping tasks all year round, as long as the ground is not frozen solid and there is not a blizzard plaguing our area. For this blog post, I’d like to focus on three garden additions that we love to install for people that want their yards to have a little extra pop to them when Old Man Winter still darkens their doorstep. People are often stunned when we tell them the Witch Hazel is actually native to our region. It is considered a large shrub or small tree, due to its rounded, open-branched form. It is one of those plants that has people asking, “What is that? !” because it is way underused in the landscape. While there are many interesting varieties available, Witch Hazels typically top out at about 12-15 feet high with an equal spread. They like sun, but a little afternoon shade makes them happy too. They boast fragrant, ribbon-like flowers when most other plants are sleepy-eyed and dormant. They also turn heads with their amazing fall color. 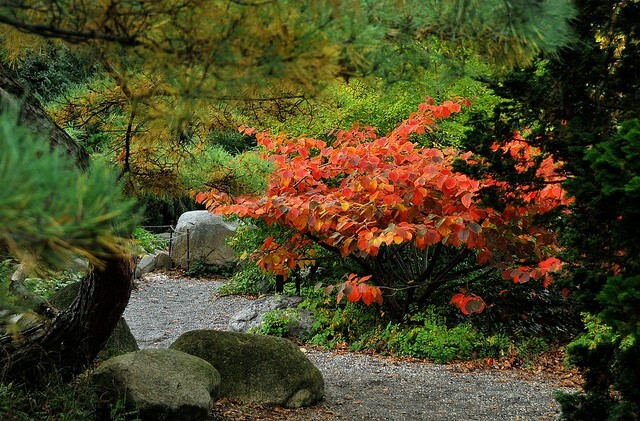 If you have an Asian/Zen or cottage-style garden, definitely look into adding Hamamelis to it this year! If you have never met Hellebore, you are in for a real treat! Not only do these terrific perennials come in many amazing colors, their palmate foliage is often evergreen! Their nodding, blushing blooms adorn the garden in late winter all the way through early spring. 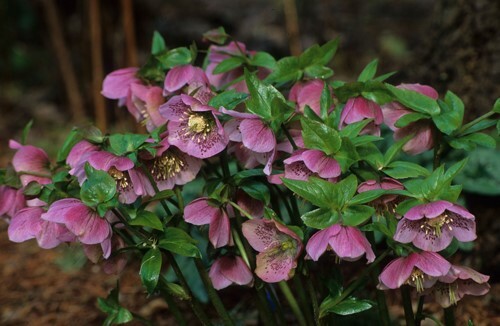 Hellebores favor a relatively shaded area that is well-drained and rich in organic matter. Mine live quite happily in part sun, as long as I keep the soil a little moistened on the warmer days. They are generally between 1-2′ tall and a little bit wider than tall. If deer frequent your yard, they may skip over your Lenten Roses for something more palatable to them. This type of camellia blooms in late fall through to winter. With glossy, evergreen foliage, Camellia sasanqua fits an Asian/Zen or Cottage garden setting quite nicely. Varying in size and shape (usually 6-12 feet tall at maturity), some of these make stunning appearances trained to espalier up a wall too! 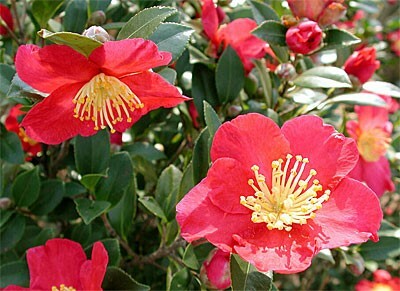 Most Camellia sasanquas enjoy filtered sunshine and an acid fertilizer. They are not too difficult or fussy, like some may believe. The flowers are also excellent cut for arrangements! If any of these beautiful winter bloomers catches your eye and you would like one installed in your yard, please do not hesitate to call us. We know the best growers and suppliers in the area and can usually find what you want, if it is in stock. We also install every plant with the utmost care and knowledge. We always use organic fertilizers with each install. Give us a call for a FREE consult – (804) 690-5516 or contact us online. 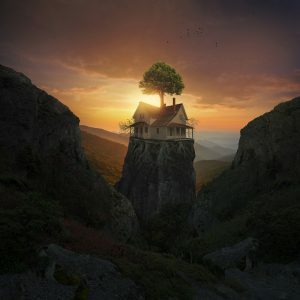 While many people see a steep slope in their yard as “unusable space,” at best, or a potential danger, at worst, we see a ton of untapped potential! 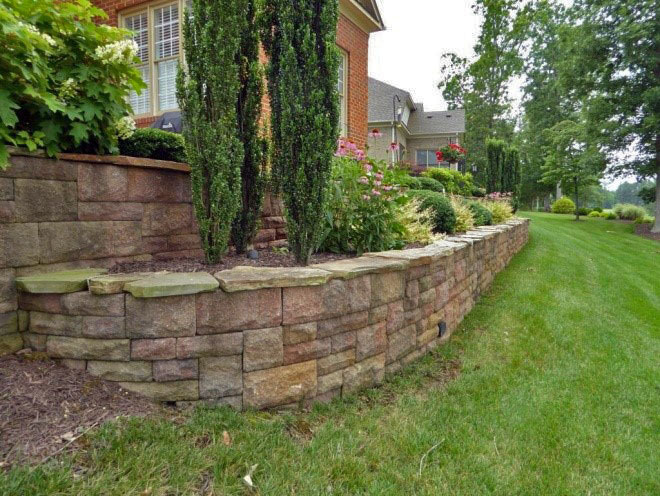 In this post, I will showcase a job of ours that included one of our favorite slope remedies, retaining walls. Though, they are only one of many solutions we offer for slope management and beautification, walls are probably the top preferred method of slope amelioration per our clients. I could not discuss the benefits of retaining walls without showcasing some of our work for a truly terrific client. We will call her “Mrs. N,” to be respectful of her privacy. She has been a loyal client of ours for over a decade, and we always look forward to working in her yard (sometimes, she even brings us chocolate chip cookies!). When we arrived for the first consult for Mrs. N, she showed us the problem right away – a steep slope that started only feet off the foundation of her beautiful, villa home on a picturesque golf course. Her view of the golf course was breathtaking, but the potential for serious ankle sprains and unpleasant affairs with gravity was too great to ignore. So, we got to work on a design right away. There was also absolutely no aesthetic value to the yard other than the carefully manicured, deep green lawn. Mrs. N told us she and her husband intended to stay in that home for a very long time, so we were given the green light to “go big.” We finally came to an agreement on expanding existing patio space, adding walkways, installing colorful plantings, putting in a gorgeous, low-maintenance, pond-less waterfall, and, of course, introducing the pièce de résistance – an oversized double retaining wall using high-quality Techo-Bloc and a natural stone cap! In only a matter of weeks, Mrs. N’s back yard became the talk of the neighborhood. Not only was her yard looking less like a ski slope, it was absolutely breathtaking! The pinks, blues, and oranges of the wall block were complemented by the warm, coppery tones of the natural stone cap. Delicate sprays of variegated abelias and the cheery faces of echinacea blooms danced along the face of the top wall while the soporific trickle of water spilled down into the basin of the waterfall. And, finally, Mrs. N felt more confident about inviting extended family to her home to enjoy cookouts on the expanded patio space! The young grandkids enjoyed splashing in the waterfall without risk of drowning in a pond basin. It was easier to walk from one side of the house to the next without sliding down the slippery hill into the rocky drainage swale at the bottom! 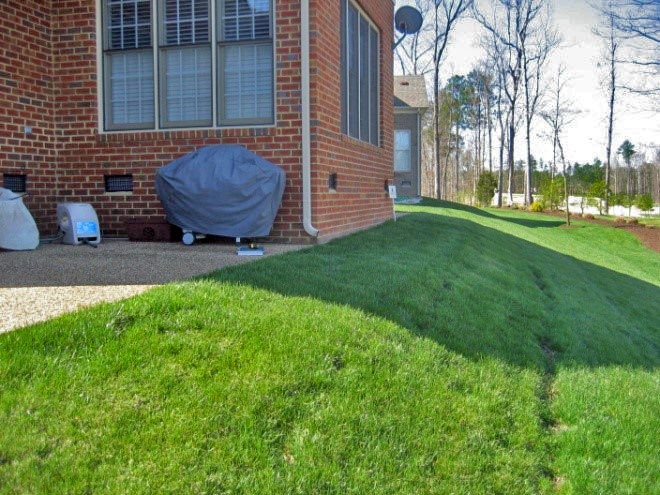 If you have a slope “problem” in your yard and wish to remedy it in a way that is both aesthetically pleasing and reliable, please give us a call for a FREE consult – (804) 690-5516 or contact us online. 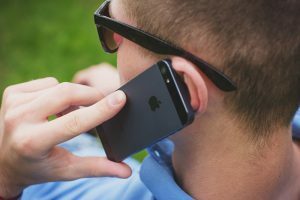 One of the first things our clients tell us when we meet with them is that they were pleasantly surprised by the fact we actually returned their phone call so promptly. Maybe I’m a little idealistic. Maybe I live in a strange, quixotic land in which prospective clients don’t have to stare at the phone for days and wonder whether it will ever ring. Or, perhaps, I don’t understand why any business would have, as its model, a lax call return policy. Do these businesses really have all the clients they’ll ever need? Yet, there it is. Contractors already get a bad reputation for their lack of promptness, and they are not helping themselves any by playing “hard to get” with new clients. We’re not claiming to be perfect. Life happens here the same as it does for you. Ankles get sprained, the dog swallows a bowlful of dark chocolate Hershey’s Kisses, and cell phones get dropped unceremoniously in toilets (so, that has never happened to you?). But, our company policy is to try the best we can to return your inquiry within 24 hours of your initial contact. Period. If that hasn’t happened, expect that the phone is praying to the porcelain god, perhaps. I know this sounds a little ridiculous and “touchy-feely,” but we really do mean it: we’re actually nice people. We did not get into our business with dreams of fleecing the little guy or making money hand over fist at the expense of quality customer relationships. This is what we do because we actually like it! We are some of the luckiest folks in the world in that we love what we do and the people we serve! When we take on your job, we often become really excited about what we are about to create in your living space. I mean, we sometimes talk about your job over our family dinner—how excited we are to be installing the newest, most ornate fireplace, how cool the colored lighting is going to look in that pond-less waterfall, how much your kids are going to love the slide system we’ve installed in your retaining wall system (yes, a slide), etc. On occasion, we may not be a perfect business match for your needs—and that is OKAY—but we always do our very best to meet your needs and expectations, within reason. And, yes, we really do treat all of our clients like we would want to be treated ourselves! You are not just an “asset” or another paycheck. You are a real, living human being that simply wants to be treated as such. We will always do our very best to live up to the Golden Rule. I cannot stress enough how much our field crew means to us personally and as a business! Without them, nothing at all would run. They are our lifeblood, and they do some of the most toilsome work in the worst of weather with such alacrity and eagerness that we are so blessed to have each one of them on staff. But, we have the benefit of such a stellar crew because we are very careful about the people we hire for this important job. It is crucial that the people who will be working at your private residence are trustworthy, honest, and able to communicate respectfully and clearly. It is also vital that each member care about accuracy and detail in his or her work. So, our crew members are as carefully hand-picked to fill the role as any executive in our company. You would be surprised how often many landscaping businesses overlook the importance of caution in field crew choice. 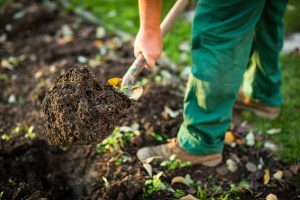 Many think a warm body to dig dirt is enough of a qualification. We disagree. Your kids live at your home. Why would we put just anybody in your yard to build something for which you saved a pretty substantial amount? The quality of our build crew is paramount to the success of our business and the outcome of your project. We will accept nothing less than quality applicants. Are you convinced yet that we are the right company to hire for your landscape design/build needs? If not, that’s okay. Maybe you need a little more convincing. Maybe you once had a very traumatizing experience with a contractor that left you with shoddy work and a steep bill. If so, we offer our most sincere apologies for your unpleasant experience. Not all contractors offer flimsy work, poor attitudes, and lax communication skills. If you’d like to learn more about us and what we can offer, please give us a call at (804) 690-5516 or contact us online to schedule a completely FREE consult. If you are still not convinced, that’s okay too. We enjoy the opportunity to get to know you anyway.